From Emilio Pucci bell sleeves to Marques’Almeida giant cuffs, oversize sleeves are all around the catwalks for this autumn/winter. Layered underneath a slip dress or a knitwear for the colder months will turn your look interesting and chic. You can also marry an other popular trend of the season, the oversized hoodie. 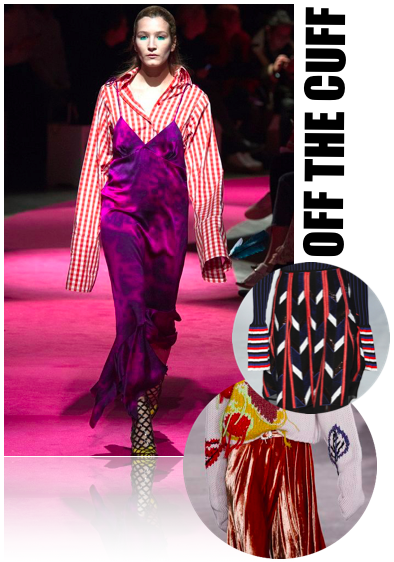 Go for a bright color (see below “Vetements” & Marques’Almeida) to brighten up a vapid look and voilà ! EMILIO PUCCI – Fall 2016 Ready-to-Wear. H&M – Fall 2016 Ready-to-Wear. VETEMENTS – Fall 2016 Ready-to-Wear. OFF WHITE – Fall 2016 Ready-to-Wear. MARQUES’ALMEIDA – Fall 2016 Ready-to-Wear. VERA WANG – Fall 2016 Ready-to-Wear. JOSEPH – Fall 2016 Ready-to-Wear.